Children in Action: Zanzibar, Tanzania - Students Helping Children Across Borders, Inc. 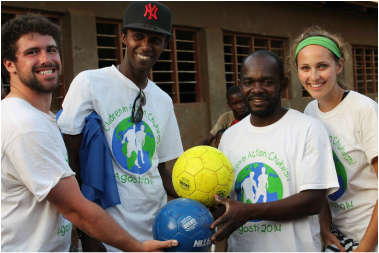 In August of 2014, SHCAB volunteers spent one month on the island of Zanzibar, working to establish girl’s empowerment and general sports programs at the Chukwani Village School (Click here to learn more) in Zanzibar, Tanzania. SHCAB volunteers worked closely with the school principal, staff, students, villagers, and a local NGO, Embrace Zanzibar, to realize the project's vision. The project team of students, teachers, and SHCAB student-volunteers built a soccer field and basketball/net-ball court at the school, with equipment and sports materials to kick-start new programs for the 2,000+ boys and girls there. SHCAB's project managers Meghan and Jeff worked with local volunteers, teachers, and hundreds of students (often coming to school early and using their recess and breaks to work on the new fields) to take the overgrown spaces and turn the school yard into a multipurpose recreation space for new teams and after-school programs. Many of these new programs specifically serve the young women at the school and will create positive outlets for better gender integration and girls' empowerment in the community. Meghan and Jeff also brought with them new sports balls, cleats, jersey pinnies, cones, whistles, and other materials to kick-start the new athletic program. The construction process took one month and brought together local craftsmen, community members, and many families in the village to create a truly sustainable and locally inspired space! Click Here to see the project's photo gallery. Why sports for the young girls and boys in Chukwani Village? Read More Here. View the project video below!! !